The "Lanterna" lighthouse is one of the most ancient still in service today. The exterrior is formed by two towers divided by cornices with small pensil arches and the interior is occupied by steps leading from ground level to the light. 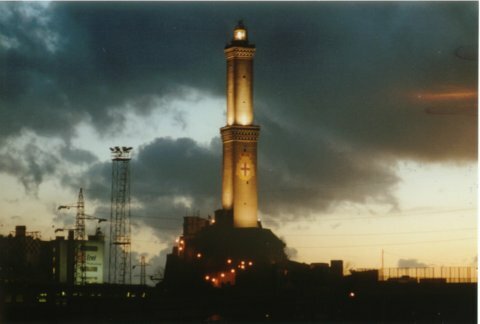 Situated on a rock on the western end of the Prt of Genoa arc, easily visible from many viewpoints is "La Lanterna", the lighthouse symbol of the city. Considering that it was and still is the port beacon, it is mainly visible from the sea. Already in medieval times the site where the "Lanterna" rises was known as Capo di Faro viz. Beacon Promontory. The lighthouse, 117 meters above sea level, radiates its light up to 36 nautical miles distance. In the district of San Beningno, neighbouring on the new office district, it marks entrance to the city to visitors arriving from the west. In the Middle Ages, the Cape Faro Tower on the western side of the coastal arc and the Molo Vecchio tower to the east served as landmarks for vessels arriving in port. Since its creation, the tower underwent numerous restorations. In 1785 Gregorio Petondi, the architect, provided for repainting, on the northern facade, of the Genoa coat of arms which had become invisible. The last restorations work was carried out, between 1967 and 1970, by the Civil Engineering Department under the direction of the Monuments and Fine Art Office. In the early nineties restoration work was carried out on the coat of arms fresco. 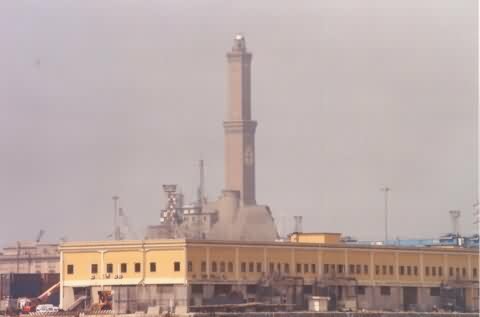 The Lanterna can be seen from ferries coming into Porto di Genova. It may be possible to gain close up access to the lighthouse, although I am not positive. The map shown is merely a possible route you can take. That route has not been confirmed to even be possible.